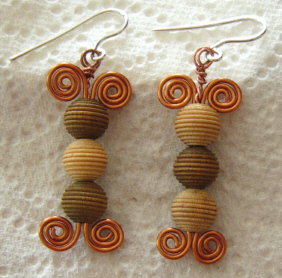 Just for fun: "Time-Spacies" Earrings. The design draws on various traditions. For example, the spirals are beloved of many ages and were very popular in the Late Bronze Age (11th-9th centuries BCE) in Central Europe, and the positioning of the spirals has a touch of the form used by the Tolima Culture's stylised knives (South America 5th-10th centuries CE).